Batch mode limited to 100 symbols per run with a maximum of 500 symbols in a 30 day period. Can be easily used in conjunction with Yahoo Ticker Symbol List available here at no charge. On release, new subscribers will be required to pay a monthly or annual fee. This limited pre-launch version offer waives the monthly or annual use fee. 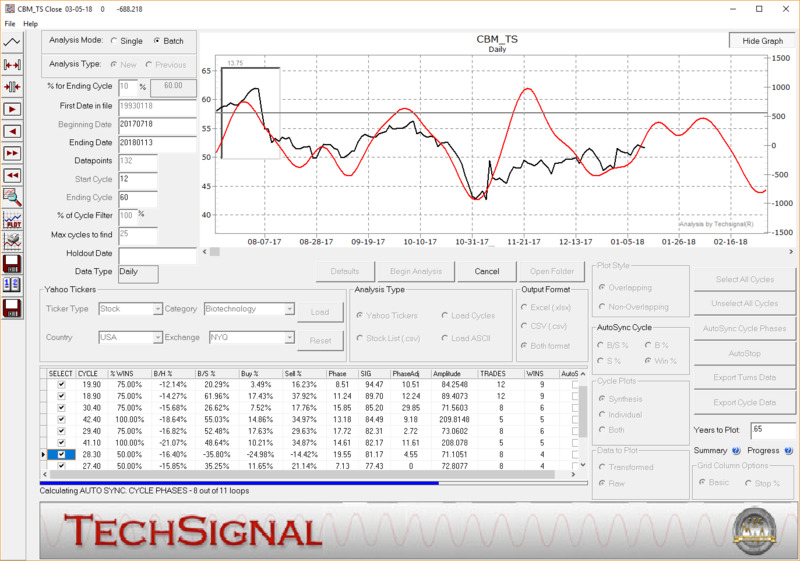 I have run a number of tests on the new Techsignal 10 Pre-Beta Release.This is a very impressive program! For your marketing, you should also mention this is not just for cycles traders as it also does a nice job of identifying stocks that have had impressive buy/hold runs. For example, it found one junior gold miner with an over 2600% buy/hold percentage from January 1 of this year. It will be one to watch in the current gold pullback. However, for cycles traders, it also identified one junior gold miner with a 350% B/H% (Buy and Hold %) - but with an 11,182% B/S% (buying and selling the cycle turns)! This is the power of cycles! It also found another junior gold miner with a -28% B/H% (Buy and Hold %) - but with a 1092% B/S% (buying and selling the cycle turns)!